Our San Luis Obispo landscapers are Central Coast’s number one choice for quality San Luis Obispo Paver Patios. With a large selection of industry leading products and experienced efficient service we can tackle any paver patio hardscaping project for both residential and commercial properties. Our skilled team of designers and contractors can partner with you to create a paver patio that is perfect for look of your entire lawn. We are a customer driven and work hard to exceed all expectations in order to bring you total satisfaction during every phase of the hardscaping process. Launch your paver patio project today and start spending more time outside. See the difference that Dan’s Landscaping Company makes! Of all patio types, San Luis Obispo Paver Patios are the simplest to install. Although most paver patios come in squares and rectangles cut at various sizes, you can custom design your pavers to any shape and in any design. We’ll construct your patio piece by piece until completion. Patio pavers require little maintenance. Since they are made of durable brick or stone they do not require as much sealing as other materials and they are very easy to clean. Although it’s always a good idea to store extra stones, paver patio stones rarely need replacing. Stone replacement, however, is very simple and fast! Installing a paver patio may seem like a simple task, but a quality job requires careful planning and attention to detail. Understanding the process will help to make sure you get the finished product you’ve always wanted. Paver patio are a major investment in your property. Our step by step process typically includes most or all of the following in order to insure that your investment is done right. Insure that your patio has a slight slope for water drainage – about an inch for every 4 feet of patio. Compact the subsoil prior to laying the base materials. Reinforce the foundation with a top layer of sand. Utilize solid edging to hold the pavers into place. 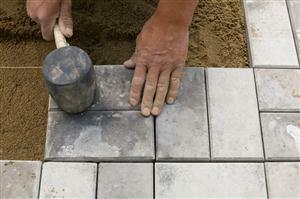 Fill in the spaces between pavers with joint sand so they remain stationary. 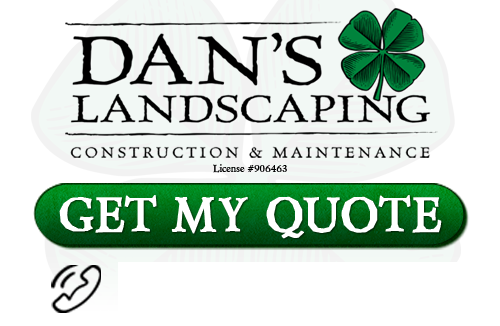 One of the benefits of choosing Dan’s Landscaping Company for all your maintenance needs is that our work is fast, efficient, and reliable. You’ll enjoy your new patio for years to come long after the work is done. We provide headache free service and closely work with each of our clients from initial design to final finish. We provide estimates, contracts, and detailed work schedules. This guarantees your satisfaction. Our entire landscaping team is certified, insured and we guarantee that the job gets done right the first time. Paver Patio Sealing & Maintenance. If you are looking for professional San Luis Obispo Paver Patios then contact Dan’s Landscaping Company at 805-550-5488 or complete our online request form.